Distributor: R1 DVD from Discotek Media; currently streaming on crunchyroll. Also Recommended: Most any fantasy Studio Ghibli movie, really. Notes: Based on the newspaper comic strip by cartoonist Winsor McCay, which ran from 1905-1914 and then again 1924-1927. A video game loosely based on the movie, Little Nemo: The Dream Master, was made by Capcom and released the following year after this movie. 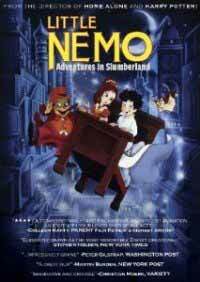 Although technically an anime, much of the work for Little Nemo was done in America as well, featuring big name producers/directors like George Lucas and Chris Columbus, music composed by Richard and Robert Sherman, and even story consulting by veteran Disney animators Frank Thomas and Ollie Johnston. However, the core concept, as well as most of the animation, and direction, was done in Japan, and thus Little Nemo is considered an anime. The review is based on the English dub, as the original Japanese version has never been released in the U.S. It is also based off the uncut dub, as opposed as the edited, 84 minute version shown in American theaters in 1992. Man this box is getting long, ain't it? Nemo is a young boy who dreams in his sleep of normal things, like flying around in his bed, nearly getting hit by a crazy train; you know, the usual. The circus is coming up, but Nemo's father won't take him due to work. That night after trying (and failing) to sneak pie into his room, Nemo and his little squirrel pet Icarus are invited to the wonderful world of Slumberland by a man named Professor Genius. He's asked to become the royal playmate of Princess Camille, as well as be crowned Prince by her father, King Morpheus. If star ratings were given to anime on THEM Anime based solely on look and style, Little Nemo: Adventures in Slumberland would get five stars and my review would end here. This is one fine-looking movie, even if the original designs by Winsor McCay are watered down for animation. It especially holds well for a movie from the 1980's, often considered one of the darkest decades in animation (and for good reason). While Slumberland's visuals aren't the most original in animation, everything looks so smooth and animates so fluently you won't care after about 10 minutes into the film. Little Nemo rarely stops moving, unlike most anime. There are lots of sequences involving constant movement: Nemo's nightmare on his bed flying away from a giant train trying to attack him, Nemo and the king of Slumberland traveling on a toy train across the latter's very vast castle, and lots of dancing and such in the film's plentiful musical numbers. The actual character animation isn't as smooth as, say, classic Disney, but it's still smoother than most anime. The musical numbers by the Sherman Brothers are far from their best, but the songs never become unbearable to listen to either. The visuals help to mask how simple the story really is, which is your typical "evil guy attacks land, and a plucky young lad must save him" scenario. Since it's so simple, Little Nemo: Adventures in Slumberland spends most of the film hopping around beautiful place to beautiful place, occasionally sprinkling songs during these events. While this might entertain your kids, anyone older than 10 or so will find it annoying rather quickly, especially when the film does two double takes with Nemo. It's also quite rushed; Nemo is crowned king barely halfway through the film, and the final climax goes on for way longer than it should, with Nemo purposely fumbling up just to make the film even longer. The movie might only be 94 minutes long, but it feels longer in some cases. It's still not too bad, though. No, if there's any real criticism to give on this film, it would be of Nemo himself. There's not much to say about him: he dreams, he wants to do boy things (like go to a circus), he doesn't likes girls, and he has a pet squirrel named Icarus (who for some reason wears glasses and can talk in high-pitched squeaks. Huh?). It's hard to identify with a character when you could make your own one up, and his limited dialogue - mostly shouting and saying how great something is - doesn't help. Maybe this kind of character worked back in the early 20th century in the comic strip, but in a feature film he makes for a flat, boring lead. I don't mean to say they should have made Nemo edgier per se, but it wouldn't have hurt TMS to make him a tad more interesting. And Nemo's blandness wouldn't be so bland if not for the fact that two supporting characters - King Morpheus of Slumberland and Professor Genius - don't get much to say or do due to how much time the bland Nemo takes up of the film. Princess Camille is more fleshed out (and a better lead than Nemo himself at times, being one of the few people to actually take any sort of action in the flm), but it takes a while for her to really do much of anything. So you'd think I'd hate Little Nemo: Adventures in Slumberland from what I've said. No, not really. It is visually creative, and Princess Camille and Flip are decent enough characters to help move the mostly painless film along, but the lack of structure alongside some annoying aspects (disjointed story, lame climax, bland hero) prevent it from being more than average at best. The movie took 7 years to make (it started in 1982, but didn't begin full production due to so many drafts/script changes until June 1988, barely over a year before it came out), and it clearly shows. While beautiful, creative, and even occasionally charming, Little Nemo: Adventures in Wonderland is a rental at best, and even then only if you have kids. Adults, either check your brain at the door, or have a pillow ready for napping. Recommended Audience: Flip smokes quite a bit, which may not go over well with some parents. Aside from that, there's just some slapstick and mild animated violence. Fine for kids.